This environmentally friendly recycler with its sleek contemporary design affords innumerable applications. Constructed of heavy-gauge steel; this Precision Series Recycler waste container is fire and corrosion resistant offering greater structural integrity for long service. 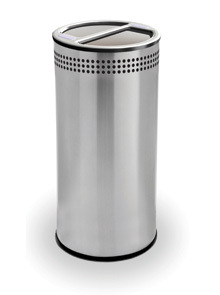 Two large capacity, removable 10 gallon galvanized liners with handle neatly stores your recyclable waste. Rubber guard on base protects the floors and keeps unit securely in place. Encourage compliance with decals to identify your recycling program requirements. Included decals labels for trash, aluminum, glass, plastic, paper, and mixed recyclables. ►Need a Recycling Container Fast?